The Power Badger’s patented function is a major leap forward in energy savings and reliable cold weather vehicle starting. Here’s how it works: Simply set your desired “Ready Time” and the Power Badger™ does the rest. By controlling the block heater (or pad heater/s) installed on your engine, the vehicle will be ready to start at your desired “Ready Time” using the minimum amount of power necessary. Saves energy and $$$ ... Pays for itself in 1-2 seasons! Until now engine heaters were inefficient, uncontrolled energy wasters. Most engine block heaters use energy all the time (as soon as they are plugged in). The majority of people simply plug in their heater when the get home and let it run constantly, all night long, often wasting 500-1500 watts of power per hour. That’s $1.15-$5.45 of wasted energy per day (depending on your heater wattage, climate and local power rates). In cases like these, the Power Badger™ could pay for itself (in energy savings) in less than one season’s use, and will almost always pay for itself within 2 seasons use. Use the Savings Estimator below to see how much you could start saving with the Power Badger! What time do you generally plug in your heater? What time does your vehicle need to be ready to start? How is the Power Badger™ different (and better) than a timer? 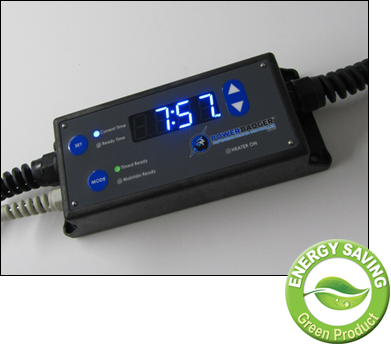 Automatic: More than just a timer, the Power Badger™ is a block heater controller that does the time calculations for you, based on actual outside temperature. No more guessing about how cold it may be tomorrow, next week or many weeks from now, the Badger will make the timing adjustments for you, automatically, every day. Maintain: When a simple timer reaches the set “end” time, what does it do?....... it just turns off,... allowing your engine to get cold if you are not right there to get it started. With the Power Badger™, once the (user set) “ready” time is reached, the Badger will maintain your engine in a ready-to-start condition for up to 9 hours, using as little electricity as the temperature allows. Durability: Unlike most timers, the Power Badger™ is designed for the extreme cold and is water resistant. In tough winter conditions the Badger will easily outlast most every timer on the market. Capacity: The Power Badger™ can safely handle up to 1800 watts of heater load. Most timers can only take a fraction of that wattage. Memory: Loss of electricity changes the timing on a manual timer, but not with The Power Badger™. The Badger has a built-in battery backup that saves your settings and maintains accurate time during the outage, up to 6 months! When the electricity comes back on, the Badger picks up right where it left off. No adjustments for power outages necessary! Long Cords: The Power Badger™ has 5’ long cords on either end (for a 10’ total reach) allowing it to be used as an extension cord itself. Most simple timers have a very short pigtail and a plug outlet, requiring the timer to be hung on a wall right next to a power outlet and necessitating the use of a separate extension cord. Smart: No power usage when temperatures are above 40° F.